The age old quandary of what came first, the chicken or the egg, is something that existentialists and profound scholars will argue until the end of time. Luckily with gaming, we know what came first; the PC or Personal Computer. These two technological titans have been battling a secret war since the dawn of gaming. In today’s generation, the PC has ascended to something beyond what the current consoles can offer. The PC has always had an edge in terms of sheer power, but the way we understand game consoles is changing. Sony is fully aware of the threat PC poses. Today we’ll look at how they plan to tackle this beast once and for all. With the PlayStation 4, we have great exclusives, but today’s modern PC’s can easily outperform any major console release. In addition to graphics, PC allows the gamer to tailor their experience beyond an aesthetic level. With console, the painting is complete, and the gamer can only appreciate what is given to them, flaws and all. With PC, the gamer is given the painting, but also the brush, and the paint. They can tweak tiny details or create entire mods to carry the game into a new form. While the PC still has the edge in a number of ways, including the ever popular mainstay mouse and keyboard controller scheme, consoles have been catching up. Looking at the PlayStation 4 for example, we see an internal architecture vastly similar to a home computer. We look at the Steam Boxes, and we see a home desktop that is pre-built and ready to game, much like a console. Do you see what’s happening? With each passing year, the console becomes more like a PC and the PC becomes more like a console. The level of customization that PC has in regards to tweaking graphics and modifying the hardware is still there, and still creates a major difference between the two devices. Even so, PC is becoming more streamlined and there seems to be multiple breeds of computer emerging. Some are devoted entirely to business, while others are given hardware specifically for gaming. This emergence of different species is also something we’ve seen in gaming. We have consoles that are used entirely at home, consoles for use on the go, and smart devices to play apps and casual games. With so many emerging concepts and possibilities, you have to wonder if things will continue to expand, or consolidate into a more well-rounded device that tackles all of these purposes? So where then, does the future take us? We’ve already seen how vastly technology will change in the coming years to herald the release of the PlayStation 5, but how will these advances affect the home computer? Will PC gaming stay on top or will these two warring factions finally reach a treaty? The answer, as always, is complicated. Home computers have always held a number of purposes. They are used as customized gaming machines, as processors for infinite amounts of data and statistics, and as windows into the world wide web. Consoles have never been able to truly match this widespread use, mostly because consoles have always held a gaming centric focus. When it comes to PC, Windows is the top dog. Other operating systems like Linux and the new Steam OS have their user base, but Windows is still on top. I would mention Mac, but the gaming scene there isn’t anywhere near as large as PC. With that kind of power in Microsoft’s hands, it’s easy to see how they could shape the future of PC to their whim. This hostile takeover of the PC gaming landscape began at E3 2016 when Microsoft announced the Xbox One Xpreviously known as Project Scorpio. During this press conference, Microsoft laid the foundation for a future where Windows unified both their consoles and PC platforms. It starts with their “Play Anywhere” program that allows first party titles to be played on console and PC with one purchase. You can even transfer your saved data between PC and console and pick up where you left off. All of this came to fruition with the announcement of the Play Anywhere program and Xbox One X. Microsoft has essentially bridged the gap between console and PC, and while it’s still flimsy, it leaves the door open for continued connections between these two platforms. With the onset of high speed optics technology such as Light Peak, and the creation of high fidelity virtual reality, consoles are moving toward a world that integrates games into our everyday lives. With PC, the trend is simple; computers are becoming smaller and more powerful with each passing year. Christopher Lampton, an author who has written over a hundred books on the subject of consumer technology, had this to say about the future of home computers, “Over the next few years we’ll see two major trends: one is the increasing interconnection of the electronic devices we use on a daily basis and the other is the proliferation of smart, tiny gadgets that can be used away from home.” Similar to portable gaming, PC is moving towards more interconnected and portable technology that goes with you. While this is true, it’s also important to note that there are still plenty of gamers out there who would rather have a bulky desktop than a portable PC if it meant that they have the best hardware possible. The kind of video cards and processors that it takes to run a modern game at maximum settings is not something you can stuff into a smartphone or even a tablet. That’s not to say the technology can’t or won’t be there in ten years, but as it stands, if you want power, you need something that isn’t portable. It has to be stationary and it has to be outfitted with a cooling system because these processors and video cards put off some serious heat. Five years from now, we could see a number of different technologies come to fruition that could benefit both the home computer and possibly affect how the PlayStation 5 will function as well. Such innovations include the onset of Cloud computing which allows data to be stored on remote servers, essentially opening an infinite number of storage opportunities. The concept of a remote server, A.K.A the “cloud” is also something that can provide the hardware needed to run modern and future games. These games would be handled by massive servers and the game itself would simply be streamed to you, similar to the way Netflix streams movies and TV shows. What this means for you is the ability to access any and all games at maximum settings without the need for the hardware in your possession. This could unlock the ability for PC to become a more portable platform. PlayStation is already ahead of the game in this regard with PlayStation Now. This service does exactly as I’ve described, it allows games to be streamed directly to you. Then you have the onset of Nanotechnology which allows for the use of magnetic traps and quantum qubits. Or, something even more exciting is the creation of artificial DNA. With artificial DNA, each strand is able to process individual streams of data while keeping a cohesive whole. Recently, a working computer was built using a strand of E.Coli bacteria that successfully completed mathematical equations faster than a standard computer based on the current silicone chips. Be careful, the next time you catch a cold, you may actually be harboring a little sentient computer with a name that rhymes with Skynet. PS5 and PC: Where Does PS4 Pro Fit In? The biggest issue that consoles currently struggle with in regards to PC, is the technology gap. PC’s can be upgraded on a whim, while consoles must wait for another cycle to make that jump. In addition, certain genres of gaming such as MMORPG’s (Massively Multiplayer Online Role-Playing Game) and RTS (Real Time Strategy) have yet to find footing on the console because the controller doesn’t present the proper number of options to withstand the complex systems of these games. We’ve seen some admirable adaptations, especially in VR with Move controllers acting as your cursor or in-game hands. Games for PlayStation VR like Tethered, Korix, and Dino Frontier all offer a light RTS experience, but prove that motion controllers can be used to make precise adjustments and commands to units in the game. Sony is looking to take the fight to PC owners early this generation with the confirmation of their “high-end” PS4 known as the PS4 Pro. I love it! Sony is fully aware that PC is ahead, but PS4 Pro is meant to bridge the gap between what can be done this generation, and what can be done in 2020 when the PS5 releases. Speaking of, let’s explore some of the ways the PS5 can get ahead of the PC curve. The mouse and keyboard are a perfect union, a controller that has stood the test of time. Controllers constantly change with each generation, but the makeup of a mouse and keyboard hasn’t changed significantly over the years. The coming years will bring a significant amount of change for this age old combo. Voice commands will be far more prevalent but people will always require something tangible and solid, which means the mouse and keyboard may still be around. While it seems like a technology that comes and goes, virtual reality and augmented reality have suddenly become relevant again. In the case of these two, there is a small difference. Virtual reality places you entirely within another world while augmented reality changes the world you see in front of you by adding or taking things away before your very eyes. This type of technology opens up a level of control and immersion that we’ve never even imagined. With games that react to the way you move and worlds that come to you, this could be the next great leap in the world of gaming. Again, Sony is already making steps towards this future in the form of PlayStation VR which is a proprietary virtual reality headset for the PS4. While this does not remove the need for a controller altogether, it does put us on that path. Intel has also been working on technology that can tap into the user’s thoughts. Computers that utilize a magnetic resonance scanner, which analyzes some twenty thousand points on the brain to differentiate between individual words. Computers that are powered by human thought would allow us to game on the go, with precise and constant feedback from the game based on what you are thinking. With the PlayStation 5, we’ve already seen how this technology could be incorporated as well. Processors will be as powerful as the human mind and controllers may go to the wayside in favor of virtual reality and mind controlled experiences. These kinds of innovations, unlike the specific use of a controller or a mouse and keyboard, are universal. The concept of controlling something, be it a game, or even a business email, with your mind, can be applied to all aspects of technology. The issue of what games will play and perform well on the future PC and PlayStation 5, isn’t an issue at all, because technology will reach a point where it becomes universally capable and relevant to both platforms. When you’re comparing consoles and the modern PC, you have to remember that such arguments are never clear-cut. While the PC can easily best the console in terms of power, what about cost? PC games look great when you crank up the specs, but can your rig do 4K? A console costs between $399 and $499 typically. A high-end PC with 4K capabilities can easily run you $1K or more. True power seekers will spend up to $1,500 on the video card alone! PC rigs have limitless options for power, but developers also manage to squeeze a lot of power out of a console over the course of a generation. Don’t believe me? Try comparing a launch title on PS4 to Horizon: Zero Dawn. Console players have more options that ever. While PC’s catalog will always be larger, with the ability to play older games on newer machines, modern consoles still enjoy a wide selection. Whether it’s charming indie titles, or powerhouse exclusives, there are plenty of must-have titles you can only play on a PlayStation console. Depending on your PC rig, you can get a good amount of mileage out of it. If you’re trying to stay on top of technology, you’re going to be upgrading parts a lot, though. Consoles, on the other hand, offer stability and security for years into the future. Even with iterative console releases like PS4 Pro, your standard PS4 still plays all the latest games. So, to say that the PS5 could or will be beaten by the PC is a bit of a misnomer. There are things that the PC does better, but there are also plenty of benefits and options that the console offers. The two have never truly been at odds, but it is interesting to compare the pros and cons you get with each one. Many may cry foul at these words, but it is my firm belief that the next generation of gaming will herald an end to the constant struggle between PC and Consoles. Microsoft’s Project Scorpio and their Play Anywhere program is the first true bridge we’ve seen between PC and consoles in, well, ever. Sony will want to follow suit with some kind of program that removes that barrier between console and PC. If they can perfect the technology used for PlayStation Now or their Remote Play feature, then they will have the perfect platform to make games go with you. With Remote Play already available on PC, the roots have been planted. Consoles have spent decades trying to keep up with home computers in terms of power and versatility, but technology is quickly becoming unified in its goals. Control is being relegated to voice commands and the human mind in the far future, something we all possess in equal measure. Graphics will reach a plateau where it becomes photorealistic, data will be stored using nano technology, and digital downloads and cloud computing will bring about an end to physical media. Light Peak technology will bring us everything we want, when we want it. These are not competing elements of an ongoing war my friends, these are the innovations of the future. They do not favor console or PC, they do not see in black and white, they are universal and all encompassing concepts that will bring forth a new age of gaming and technology. The PlayStation 5 and your PC will be the best of friends. Sony will find ways to connect and stream experiences similar to the Remote Play support we see on PC now. In this way, they will have a Play Anywhere program like Microsoft. No longer warring factions, but equals that stand together and work together to bring you new and exciting games and experiences that are almost impossible to fathom. Peace is coming my friends, and it will be a victory for us all. There’s also the potential that the line between the two remains the same, but even in that scenario, we’ll still enjoy the benefits that only a console can offer. The PC and the PS5 can, and will, co-exist because they each offer their own unique benefits. While Sony does acknowledge that they lose gamers to the PC mid-generation (one of the motivations for PS4 Pro), this simply means that consoles need to offer more exclusive benefits. I’m not sure that 4K is the benefit that we should lean on, but it is a compelling argument. After all, no $400 PC is going to offer 4K resolution on the latest games. I think Sony would do well to focus on other benefits, like exclusive titles, and the longevity that a console offers. They shouldn’t feel threatened by the PC, but that’s just my opinion. Are you a PC Gamer or are you a Playstation Gamer? Do you favor one over the other? Do you enjoy both? Post your comments below! Has the PC already beaten the PS5 before it is released? what if ps5 is pc? But what if the ps5 is a pc? The PlayStations will always rule! I play both PC and console, but PC almost always wins. In a few years, all games will be available for Xbox 2, PS5, and PC as well. And also, I like upgrading graphics cards and hard drives and such rather than blowing $400-$500 every time sony or microsoft decides to release a new console. On top of that, PC has more free games + 94% of their games are $59.99 plus tax. PC gaming is dead. Right when Steam was launched, it died! I know this is off topic, but if I was to get my first console, should I save up for ps4 or wait for ps5. I’m only 15 and Asian so I get free money every year and this is also the first time I decided to save up money. Computer is better because the computer is the 1st and the playstation are 2nd the computer can be console and the pc is higher graphics and Memory the Playstation is low but look at it the spec of it…..
Don’t be so aggressive, everyone! I think all gamers, regardless of if they play the astounding PC, the incredibly awesome console or even those little mobile games I don’t like, should get along and just GAME! There is not a Console Gaming Nation or a PC Gaming Nation, there is a United Gaming Nation! 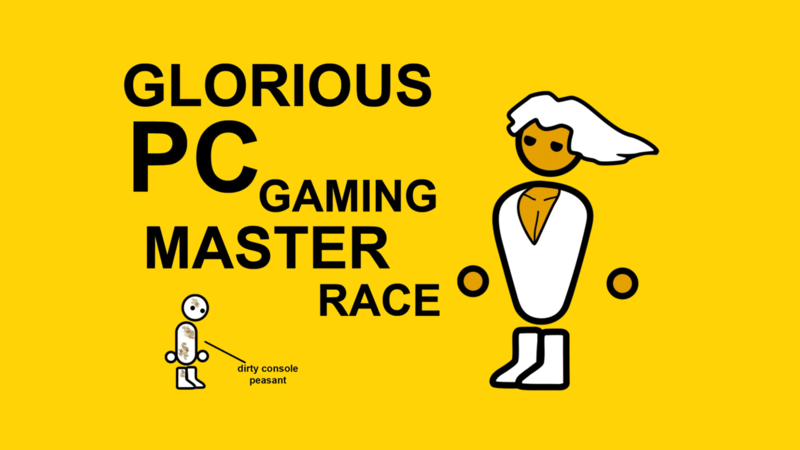 Honestly you actually think you console peasants can beat our glorious master race? There is no way in hell a puny console is better than a significant beast who excels in everything a console could even imagine. PCs will be always 1 step ahead of consoles. PCs will continue to evolve while consoles continue to remain in their weak form, manipulating fat nerds into thinking they have the best system up to date. Think twice before you actually say anything. You sound like you would have fit in Nazi Germany perfectly…. playstation 5 really beats the computer? What? pc is not better in any way, and this article was certainly made by some pc gamer trying to sound like some kind of master race idiot, i like pc, but I love console.